A number of factors can push demand for a stock up or down. Stock prices, like the prices on any goods or services that are bought and sold, are set primarily based on the supply of the stock in the marketplace and investor demand for the stock. As Wall Street veterans say, when there are more buyers than sellers of a stock, its price rises. When there are more sellers, the stock price falls. A number of things impact demand, including a change of management that is seen as beneficial to the company and an earnings announcement that beats analyst expectations. Stock exchanges and the over-the-counter markets operate on an auction system. On the New York Stock Exchange, for example, specialists receive orders from brokers, who are transacting orders for their firms' clients. Each specialist maintains a book of orders to buy and sell stocks he manages. If his book contains more sell orders than buy orders for a particular stock, he adjusts the market price of the stock down until the sell orders equal the buy orders. The process is reversed if he has more buy than sell orders. Over-the-counter desk traders operate in the same way. They manage the market for their specific stocks in the same way NYSE specialists manage the markets for their stocks. Changes in investor demand for a specific stock come from changes in the overall market, announcements from the company, and the volume of buys and sells. A news event that sparks a general market rally will attract buyers, and demand for certain stocks will outstrip the number of shares offered for sale. This raises the prices on those stocks. If a company announces good news, investors are attracted to buy the stock. In turn, the ratio of buys to sells rises, causing the price of the stock to rise. Similarly, if a large institution buys a large block of stock, or the stock becomes the target of a corporate acquisition, the volume of buy orders to sell orders rises and so does the stock price. 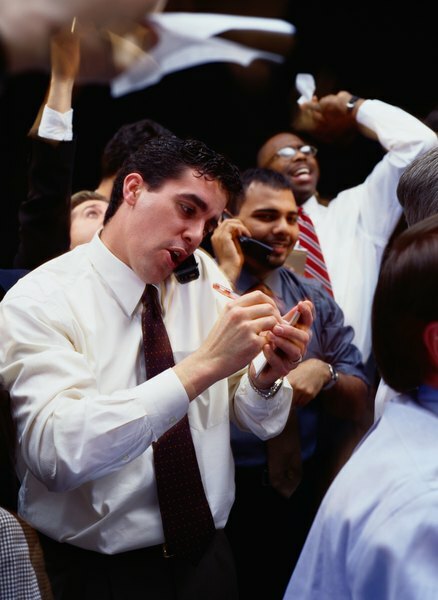 When the overall stock market declines because of a news event, such as a decision by the Federal Reserve to raise interest rates, many investors sell stock. This increases the number of sellers over buyers and drives down the market prices of most stocks. When a company announces disappointing earnings or the loss of an important contract, there will be more sellers of the stock than buyers, and the stock price will decline. Occasionally, a large holder, such as an estate or mutual fund, liquidates an unusually large holding of a particular stock. This raises the volume of sells to buys on that stock, and might drive the price of the stock down if the specialist or trader handling the order doesn't ease it into the market by selling small amounts at a time. Anytime a large block of stock is dumped on the market, the price of that stock will decline until balance between stock offered for sale equals stock bid for purchase. When a company issues news that is expected to cause either a mass sell-off or huge buy interest, trading will be halted in that stock. The same thing happens if the overall market experiences a shock. Trading halts allow the market to absorb the news and give specialists and market makers time to work through their existing order inventory. Often, when bad news comes out, the first round of orders reflects panic selling. Later orders reflect buyers who see value in the stock once the bad news is known. A trading halt allows the market to move toward balance on its own. If sell sentiment still outweighs buy sentiment, the stock price will decline steeply until another trading halt is called. Business Times: What Causes Stock Prices to Move?